Growing Peanut: Two Months Already! 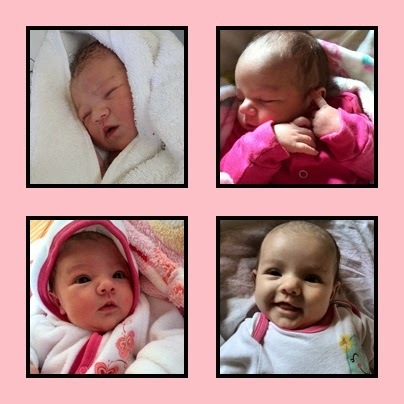 Wow, cannot believe that our baby girl turned 2 months old on the 12th already. Guess time flies when you are having fun, changing diapers and feeding the baby! It has been a wonderful and challenging 2 months. Newborn babies are very new to us so we had (have) a lot to learn. Luckily my doula are always available to give advise and check up on us. On the other hand my husband has been and is the rock in my world. When discharged from hospital I was still very sore and stiff and he just took over everything. I basically just fed the baby. He looked after everything else, the house, animals, groceries, me and little Peanut. And now 2 months down the line we are establishing a bit of a routine and are getting the hang of things. We love and adore this little girl of ours. She is what I would think an easy baby. Cries only when really necessary, sleeps well at night and lately gives the most beautiful smiles. She does however not sleep during the day. She will take little power-naps. This got so rough on me that I've asked a friend to play nanny and come and look after the baby for 3 hours in the morning in order for me to get a couple of things done. Breastfeeding did not work out entirely as expected. The plan was to try and breastfeed exclusively for the first 6 months. Peanut did however not gain nearly enough weight and by week 5 and trying every trick in the book we called it a day and started to supplement with formula. That turned our hungry little munchkin into a not so completely hungry one and she gained weight beautifully. The grandmothers also got to visit as we baptised her on the 26th of October. She was such a good little girl and the grandmas are very in love with her. I look at this little person sometimes and still cannot believe that she is real. She is so worth the wait. My heart just wants to explode with love. I will try to post more updates, but at the moment I am having my hands full of beautylicious little baby bums! What a pretty little girl Juanita!!! Lovely smiles! Ah she is adorable! I'm sure she is keeping you busy. Don't worry eventually they consolidate the nap into a nice long one and you get more done! She is beautiful and adorable!! !